Last week, Cleveland celebrated the 10th anniversary of its famous Bus Rapid Transit line, the Healthline. Inspired by the success of Curitiba, Brazil’s BRT line, the project was meant to serve as a demonstration project for bus rapid transit in U.S. cities. The anniversary of the Healthline made us wonder: how are the earliest bus rapid transit examples in the U.S. performing? Pittsburgh was way ahead of the game with bus rapid transit. The city launched its South Busway — a road built exclusively for buses — three years after Transmilenio opened in 1977. The 4.3-mile busway inspired several other local projects, the East and West Busways, which were constructed in the 1980s. These “highways for buses” offer dedicated lanes, but lack some of the other features that make bus rapid transit so much speedier than standard bus service. But they are still powerful people movers today and may help explain why Pittsburgh continues to outperform peer cities on transit commuting. The South Busway carries about 5,000 daily rides on the bus routes it serves, according to the Port Authority of Allegheny County. Meanwhile, the East Busway is the biggest people mover, carrying about 12,000, ridership that rivals Pittsburgh’s Red Line light rail. L.A. Metro’s Orange Line is a big, undersung success story. This 18-mile bus rapid transit line serving L.A. San Fernando Valley carried about 25,000 daily rides in 2017, Curbed reports. That’s well ahead of what the agency had originally projected: 22,000 daily riders by 2020. 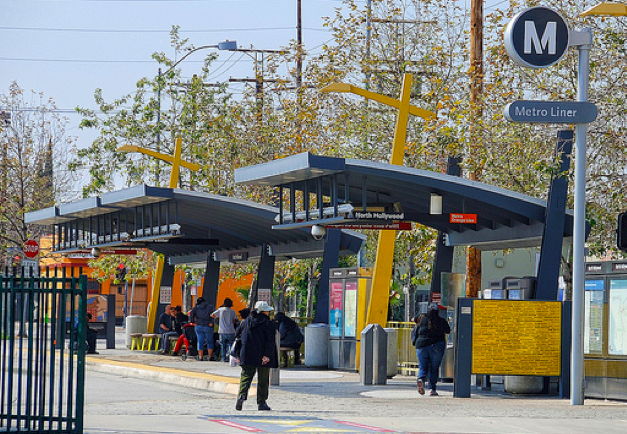 While it is older than Cleveland’s Healthline, L.A.’s Orange Line doesn’t get any “respect,” as the nation’s best performing BRT line, Curbed’s Patrick Sisson complained in 2017. Metro is set to improve service as well. The agency recently broke ground on a project that will build bridges at a couple of key crossings. The project is expected to shave 20 percent off travel times. Cleveland’s Healthline includes most of the elements of a high-quality bus rapid transit system: off-board fare payment, center stations, level boarding, dedicated lanes, signal priority, carefully spaced stations. It also has relatively frequent, round-the-clock service. The $200-million price tag also included a complete street rebuild and streetscaping. The bus service features cost $50 million. On the 10-year anniversary, Cleveland’s Regional Transit Authority celebrated the line’s success in spurring development — roughly $9.5 billion in construction projects since its opening. The return on investment, they told the Plain Dealer was $195 for every dollar spent. The Healthline has had some bumps in the road. For years, service suffered because the city turned off some of the signal priority system, that was meant to give buses a jump on traffic at traffic lights. And last year a local judge ruled that the RTA’s enforcement of its “proof of payment” system was unconstitutional. RTA had been using armed transit police to spot check every person aboard randomly selected buses for tickets. This saves time by avoiding lines at the entrance to the bus. But a local judge said it amounted to unlawful search. Since the ruling — RTA tried to appeal, unsuccessfully — some riders say the system has slowed. Ridership plunged a stunning 18 percent year over year. But RTA says while ridership is down, revenues are up 75 percent. Many of the previous riders were not paying. Even after the change, the system was still generating a respectable 11,300 rides per day in 2018. In addition, in 2017, the line brought in $4.5 million in fare revenues, almost as much as its $6.5 million operating costs — an amazing 73 percent farebox recovery rate. Opening in 2007, the $24-million Green Line brought faster bus service between Springfield and downtown Eugene, Oregon. Prior to the project the bus service on this corridor averaged 11 miles per hour. The Green Line, with its mix of dedicated lanes and mixed traffic, brought average speeds up to 15 miles per hour. The line also boosted ridership 74% from 2,700 to 4,700 daily riders. Since then “The Emerald Express” has been extended twice: in 2011 and 2017. It now provides service to West Eugene at 10 minute headways during daytime hours, with off-board fare payment and all-door boarding. 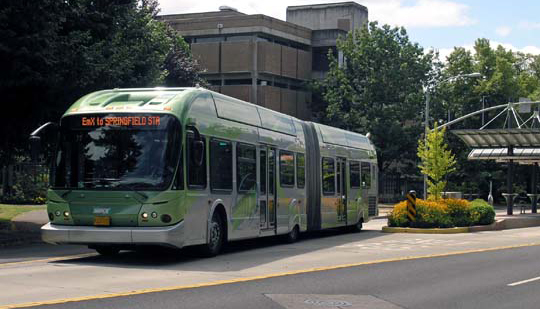 Connecticut’s CTFastrack, built at a cost of $550 million in 2015, has all the elements of bus rapid transit: level-boarding, off-board fare payment, dedicated travel lanes, center-aligned stations. Running 9.4 miles between Hartford and New Britain, the line serves 12,000 rides a day, according to ConnDOT, and about 18,000 ride either the BRT or the bus lines feeding it. 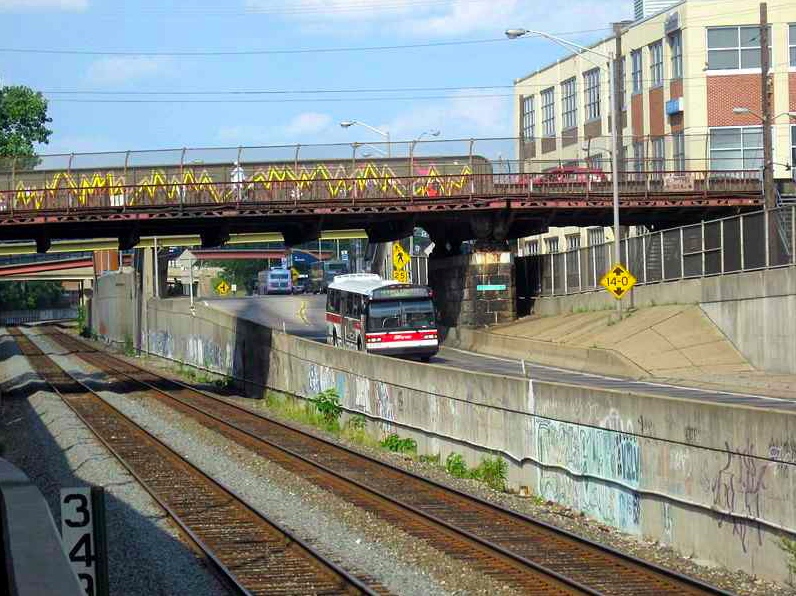 Prior to the construction of CTFastrack, the corridor averaged 8-9,000 trips. The line has exceeded ridership projections from the start and has started to generate some walkable development. The line helped make Hartford one of the most-improved cities in job access by transit between 2015 and 2016, according to an analysis by the University of Minnesota. Note: This article only examined early Bus Rapid Transit systems that the Institute for Transportation and Development Policy classified [PDF] as Bus Rapid Transit. It might be worth an addendum to talk about the El Monte Busway that opened in 1976. 11 mile dedicate busway was built 1973 making it even older than any of the busways listed in the article. CTFastrak cost over 1/2 BILLION DOLLARS for 9 miles of busway built on an abandoned rail ROW. For that kind of money, they could have built a full-blown LRT. This is hardly an example of BRT “working well”. How can we forget the Omnitrans sbX Green Line? Not really. The biggest benefit of CTFastrak is that it allows the operation of the direct-service model. Express services, limited services, and varying suburb-to-suburb movements that the busway permits wouldn’t be possible with LRT. Additionally, unlike the buses, the light rail vehicles would have needed in-street infrastructure to reach the cores of the two downtowns from the existing termini. At a rough cost of $100 million/mile (assuming that the freight railway wouldn’t have kibosched the project), an LRT probably would have cost upwards of $1 billion. The distance from Union station to downtown Hartford is only 1/2 mile. And probably about $50 million, 10% the cost of the entire busway if you wanted to bring LRT to it. The direct service model allows a one-seat ride to these locations for a far lower capital cost. Sorry, but Drunk Engineer is on the mark. That BRT line cost nearly $60 million per mile which is solidly in the range for LRT. That is obscene and a massive waste of money that could have, and should have been used for all manner of other things. The article mentions the Pulse in Richmond which built 7+ miles for the cost of one mile in Hartford. What is wrong with that picture? The contexts between Pulse and CTFastrak are dramatically different and not comparable. How much did it cost to pave over an existing rail ROW? Probably a lot more than $50 million. CTFastrak provides for flexibility in a complex region with a lot of sprawl but two relatively dense downtowns. It enabled high degrees of access by permitting wide ranges of uses on a single hunk of infrastructure. Rail would have not been able to do that and would have cost 33% more with fewer passengers (the Alternatives Analysis uncovered the potential for twice as many new transit users with a busway and direct-service model as opposed to light rail in the same corridor). What you call the “direct service model” (point-point routes) is very inefficient — transit agencies are moving away from that. Thus the CTFastrak is the worst of both worlds in that it has very high capital cost and bad service levels. For example, I note that route 121 has just 30-60min frequency off-peak. There is a well-known transit consultant, Jarrett Walker, who you might have heard of. He has built an entire business out of fixing these badly designed networks. The CTFastrak would be a great customer. It would be interesting to see a similar review of those cities that promised BRT and delivered much less, such as San Diego. How are they performing versus expectations and versus the service they replaced? Jarrett Walker is a proponent of direct-service models on linear corridors. Be careful to not conflate direct-service models with coverage models, they are not one in the same. Direct-service means that you can provide numerous services on a single piece of infrastructure while minimizing transfers. It’s not point-to-point, but works well for polycentric regions with high-demand spines. If Connecticut’s head weren’t lodged into a place only reachable by painfully contorting its body politic, it would have fast frequent rail service between cities like New Haven and Hartford. I’d be interested in a comparison of BRT and “light” rail, lifetime costs, ridership, average speed. Marin and Sonoma county (north San Francisco Bay area) voted for a 1/2 cent sales tax to finance a SMART train in 2008, to parallel Highway 101 (whenever they name something smart, read stupid). Many, including myself pointed out that a BRT using the breakdown lane of the interstate would cost far less and could carry passengers directly into San Francisco. Proponents weren’t interested in practicality or costs, so instead the train from Santa Rosa ends in downtown San Rafael with a bus and ferry transfer needed to get to the city. It’s up and running this year, but significantly shorter than promised. A parallel bike path was thrown in to sweeten the pot for voters, runs between the internal combustion driven “freeway” and the diesel powered train tracks, so not a scenic ride. Surpassed expectations or fell short? Los Angeles’ Orange Line was originally planned to be an at-grade light rail line with gated crossings, but neighbors in North Hollywood and Van Nuys demanded any rail line there be in a subway. This busway was the political result. Due to buses slowing or stopping at signalized intersections (there’s some signal priority, but buses even slow at green lights for safety) and articulated CNG buses’ slow acceleration the schedule time from North Hollywood to Canoga (Warner Center) is 41 minutes. As light rail it would have been 10-15 minutes faster with better ridership. Planned bridges at Van Nuys and Sepulveda plus crossing gates at the remaining crossings and faster-accelerating electric buses should help speed travel time to close to light rail. But there will still be a capacity limit of one or two buses crossing an intersection vs. a light rail train, thus the planned future rail upgrade. Darrell, Do you know what the Orange Line average miles per hour is? The distance from North Hollywood to Canoga is about 13.6 miles, so the 41 minutes schedule time gives an average speed of about 20 mph. For comparison, light rail on private right-of-way at 55 mph with stations 1 mile apart averages 2 minutes/mile or 30 mph. Most of these are converted from rail lines, and it would have been cheaper and more effective to rebuild the rail lines. The Cleveland and Eugene lines are the exceptions, running on streets, and actually make sense (I approve of them). Similar problems exist with the Pittsburgh and Connecticut systems, both of which are conversions of rail routes. And would have been more cost-effective and carried more people if they’d kept them as rail routes. Such comparisons have been done repeatedly. Light rail has lower lifetime costs, higher ridership, and higher average speed. This is particularly true when idiots try to put a BRT line on or parallel to a *disused rail line*, which was the case in Marin/Sonoma, Pittsburgh, Cleveland, and Hartford. Those routes were designed for rail, and it’s cheaper to operate them as rail, and they run faster when operated as rail. When the BRT or LRT line is going on ordinary city streets, as in Cleveland or Eugene, it’s a bit different: it’s expensive to convert a city street to rail and the trains end up running slowly, while BRT doesn’t usually need to replace the road at all, so BRT can be much more cost-effective there. Rail still has higher ridership, though. Someone really wanted to pave over a bus ROW. They wasted a lot of money doing so. It might be. The El Monte busway is less effective than the parallel and pre-existing passengr rail (Metrolink) line — which it stole track space from — so it’s a very interesting comparison point. Thanks, but the SMART train definitely does not match those findings. BTW there was no attempt to place a BRT on or parallel to the long abandoned rail line through Sonoma and Marin. I definitely agree with you on Pittsburgh and Hartford that abandoning a rail RoW for buses is generally a bad idea and in this case it is. I think the issue with Euclid Ave. is that there are so many other unused RoWs/track in Cleveland. With the unused track, Cleveland using existing track/rows could form its own S-Bahn to complement the buses and light rail at a relatively low per rider capital and operating cost with greater network effects. SMART is DUMB. Its farebox recovery rates aren’t enough to be worth the operating costs. A second Transbay Tube, a Geary Blvd. Subway, and a one-seat ride from East Oakland to Downtown SF (hit Embarcadero or Montgomery) and Downtown Oakland (hit 12th St.) is what is needed for SF. After that, a second MUNI Metro Trunk on Mission to increase frequency on the branches. The only case I could give BRT over LRT is that for smaller/low-ridership cities, I think 5/10 min. peak/off-peak headways on a busway are preferable to 10/20 min. peak/off-peak headways on a 1-car tramway — BRT’s higher operating costs, less smooth ride, etc. notwithstanding. Frequency is freedom. That said, every detail matters, so I’m not ready to categorically say this. Transmillenio won’t work in the U.S. Our streets aren’t wide enough (the Transmillenio streets are more like a highway/boulevard hybrid), and we don’t pay our drivers third world wages for back-breaking work. Then again, why imitate first-world cities when you can imitate third-world cities? I was about to say — the origin demand is on 44 and Farmington Ave. — not the rail RoW, which isn’t particularly walkable. New Britain is not a secondary CBD. Hartford is not a polycentric region the way, say, Raleigh-Durham-Chapel Hill or Minneapolis-St. Paul are. Correction for Stephen: people actually DID propose buses parallel to the Sonoma-Marin rail line instead of SMART. I followed the hearings. Dumb proposal. Thankfully it was shot down. By the way, the Sonoma-Marin line has always been operational as a freight line (never “abandoned”). Whether it’s really viable to have a passenger rail line through Sonoma & Marin, I don’t know; I just know buses would have been much stupider. It is meeting ridership projections. I also know SMART really needs to get to the Larkspur ferry terminal before it’s usable for most people; so the numbers to look at are the 2020 ridership counts, after it gets tehre. Proposed but no actual cost/rider comparison study. SMART is not light rail, so a BRT into SF could have come in with lower costs than rebuilding the rail line, (almost all of it was redone, because of dilapidated conditions or noise reduction) and procuring prototype (expensive) “clean” diesel locomotives. The voters were sold a project that promised to run from northern Sonoma to the ferry, but costs exceeded sales tax revenue. The minimal freight use was in Sonoma, then headed west to Vallejo south of the county line. All the Marin tracks were redone, including bridges and one tunnel needed to get to the ferry. We will see about the 2020 projections. I would challenge that assessment as working well for the Orange Line, because buses actually accelerate, brake and turn significantly faster and better than rail vehicles, and have top speeds on par with that of many rail vehicles, meaning that, all other things being equal, they will actually provide a faster service. If the bus is slower, it would suggest that all things are not equal. For the same reason battery-electric cars out-perform most gas cars — maximum torque is while standing at the start of acceleration.